As the light dimmed, multitalented instrumentalist Andrew Bird played his violin to a series of relatively experimental videos, which were eventually revealed to be done in conjunction with his new albums titled “Echolocations.” Moving swiftly from violin to guitar, Bird played violin while singing in smooth, heavenly tones (for all you violinists out there, you’ll know how hard it is to sing while playing) and concocting vibrato-filled echoing pockets of whistling strung throughout each piece. As the harmonies swelled greater and greater, layering violin riff after violin riff on his loop pedal, the sounds quickly grew to fill Bing Concert Hall with an incredibly freeing feeling. After the many stressors that Stanford throws at students, Bird’s concert was just what I needed. With that in mind, this is the second article in my impromptu series that could be loosely titled “If only I had known I could do that with my violin” (see my coverage of Mads Tolling & The Mads Men). Bird took advantage of the several ways that a violin can be used — using pizzicato (plucking as if playing a guitar), traditionally playing it with a bow and playing it “col legno” in which the musician taps the wooden part of the bow onto the string, giving it an intriguing sound that is both hollow and twangy in nature. Nevertheless, the most amazing thing was his use of the loop pedal. To my surprise, there was no need for a cello or a deeper instrument to round out the higher register of the violin — the layering of sounds via the loop pedal along with a slight reverb in the melodies was everything that was needed to create this ephemeral, otherworldly effect that has grown to become Bird’s signature style. Although Bird is known for creating these impressive, swelling melodies, he still does follow the path of more traditional musicians by doing covers and melodically-oriented songs. Often they are infused with instrumental breaks on the violin, an instrument that facilitates the creation of unstructured melodies that do not often show up in popular music. Bird’s style began to feel more and more folksy as the concert went on, but without the traditional sting of the banjo or mandolin and only a bass guitar and drum to back him up, it didn’t sound quite so much like that — more so, it seemed to evoke a calmer Mumford and Sons feel. It’s a little alternative in nature, but without the consistency of signature sounds of a crooning singer, it doesn’t quite feel alternative in nature (which is all the more ironic, considering that many artists that don’t fit nicely into another genre are simply categorized as alternative). Still, I hate to draw connections between Bird to any existing artist, because what he does all by himself on all these instruments is incomparable. Bird gained recognition when his single “Pulaski at Night” was used in the second season premiere of the Netflix series “Orange is the New Black.” I’ll admit that this was also my first introduction to Bird’s music, but I will back this up by saying that my interest in his music only grew from there. I have a very particular way of recognizing what music I like — I immediately know which songs I’ll love forever based on my instantaneous reaction to the song. As an individual with perfect pitch, some songs give me this intense feeling that fills my head with colors and textures — and “Pulaski at Night” was one of these. During the performance, Bird explained that he had a friend from Thailand who visited him in Chicago, wanting to see Pulaski Road in Chicago, at night — Bird laughed at this, joking that you wouldn’t even want to see Pulaski during the day. Nevertheless, this idea gradually spun itself into the Bird’s famous track as it grew more and more nostalgic in nature, even with the upbeat major key. The track itself is not perfect in nature — you can hear a slight buzzing in the background, as if it were recorded, and Bird’s voice is slightly muted, but there’s something about it that just grips you. Once I heard this, I knew I had to see Bird in concert. 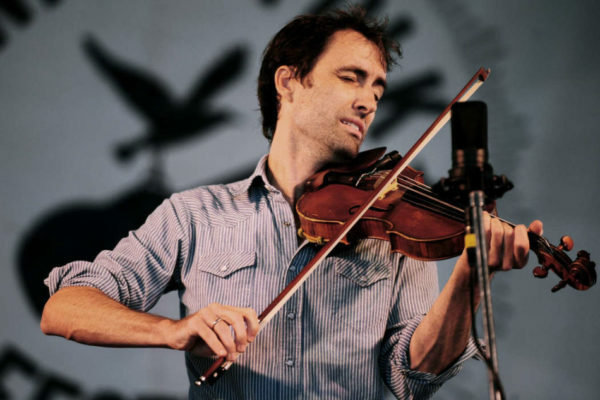 If you’re looking to explore music other than the popular realms today, Andrew Bird’s music is a great place to start. You can start more on the pop side of his music before transitioning into his more experimental, fully-instrumental works if you’re adventurous, or dive right in. No matter where you start, you’re guaranteed to be impressed by any of Bird’s work — as not a only an incredible musician and songwriter, but a charismatic individual who is passionate about his music. Andrew Bird performed at Bing Concert Hall on October 20.